Hello everyone I'm new to the saltwater fish thing. I have a 75 gal tank I purchased off a dude who had a couple of sharks and a ray. I took them over to the local fish store for credit towards other fish. I was worried that they would die on transport so kinda felt it was the right thing to do. Now I have some rocks, Dual Bio Wheel filter (i think thats what its called) And Home depot lighting. LOL I just got the light fixture there but put the proper lights in it. I added a clownfish to the tank named Taco he's just swimming around all by himself, in the tank but I will be getting him a friend shortly. So here is a list of what I will be getting next. 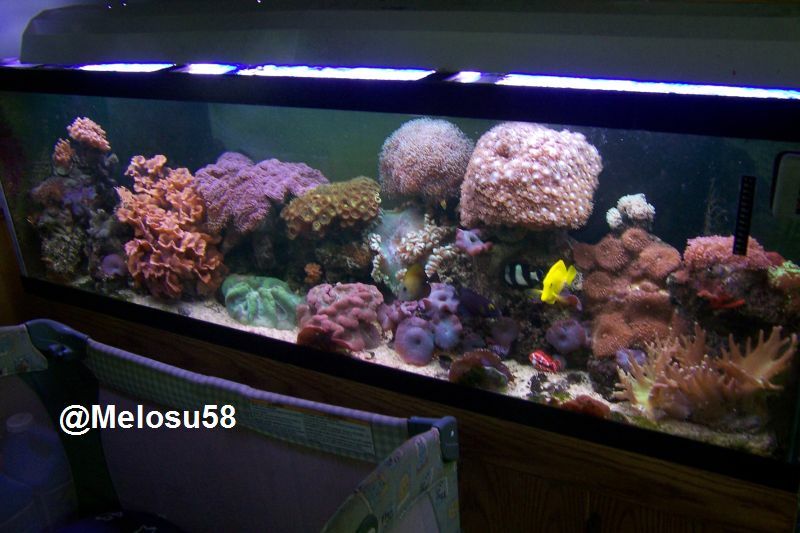 Adding another clownfish a Tang and others. I eventually want to add corals and other nice stuff. Well look forward to hearing your advise and tips! Welcome to AA! You definitely found a great place for help and advice. First, good call on getting credit for the other fish. Did you cycle your tank before adding the clown? Can you do me a favor and post your questions in the SW - Getting Started section? The tank had sand in it already so I took out half of the water and filled it back up with new water and the proper salt mix. Turned on my filter and let it do its thing for like 3 to 4 days. Welcome to AA! I'm new to the aquarium hobby myself, but I really hope to stick with hobby so that I can upgrade to a SW tank. (sticking to the FW tank to keep things simple) Anyway, just wanted to say I'm jealous that you have a clownfish, because I love them! Not to mention you named it Taco, that's a pretty sweet name for a fish! : D Any reason why you decided on that name? I guess I did miss that thread, but that's awesome! : ) Clownfish seem like great fish, I don't really know much about them yet, other than I like the way they look, like I said I'm still a noob, but I'm learning loads! : ) Does your clownfish have a name?